"Since our Performing Arts Center opened over 10 years ago, Dance All Night! 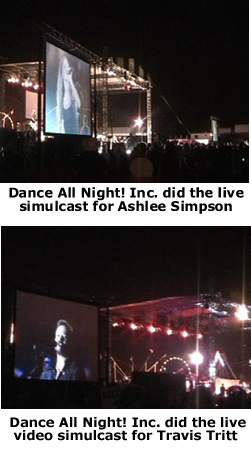 has been there to provide video projection services for acts such as Bill Cosby, Bob Newhart and the Smothers Brothers. Most recently we were host to the Joseph Jefferson Awards, and once again Bruce came through to give the awards ceremony a professional "Hollywood" feel. The response time and personal attention to detail are top notch." Whether your venue is indoors or outdoors, Dance All night! Inc. has the video projection equipment to best suit your needs. Optional short throw lens included. 641MCZ500 long throw lens also available so you can fill a front surface screen with the projector across the room. VIDEO SWITCHERS AND MIXERS, VISUALS, PLAYBACK, AND MISCELLANEOUS. Dance All Night! Inc. provides a 10.5' x 14' at the Intercontinental Hotel for Steve Cochran of WGN. Many other sizes and out door systems also available. Call for quote. Chicago Website Design by Netrix, LLC Chicago Web Development and Search Engine Marketing: Nortic Consulting, Inc.